In molecular biology, RNA structure comparison is of great interest to help solving problems as different as phylogeny reconstruction, prediction of molecule folding and identification of a function common to a set of molecules. Lin et al. proposed to define a similarity criterion between RNA structures using a concept of edit distance ; they named the corresponding problem Edit. Recently, Blin et al. showed that another problem, the Longest Arc-Preserving Common Subsequence problem (or Lapcs), is in fact a subproblem of Edit. This relationship between those two problems induces the hardness of what was the last open case for the Edit problem, Edit (Nested, Nested), which corresponds to computing the edit distance between two secondary structures without pseudoknots. 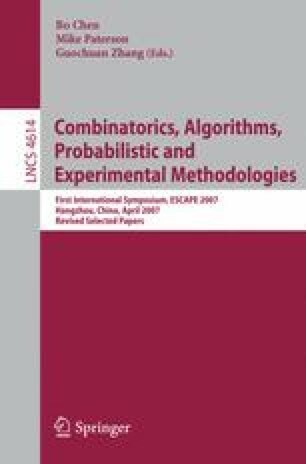 Nevertheless, Lapcs is a very restricted subproblem of Edit: in particular, it corresponds to a given system of editing costs, whose biological relevance can be discussed ; hence, giving a more precise categorization of the computational complexity of the Edit problem remains of interest. In this paper, we answer this question by showing that Edit(Nested, Nested) is NP-complete for a large class of instances, not overlapping with the ones used in the proof for Lapcs, and which represent more biologically relevant cost systems.